Welcome to airgead.ie. We are a 100% Irish owned and operated company, and are Ireland’s #1 online supplier of cash handling equipment and accessories. We cover the entire island of Ireland, North and South, from Belfast to Cork, Dublin to Galway. We carry a vast range of equipment to meet all your cash handling and security needs. 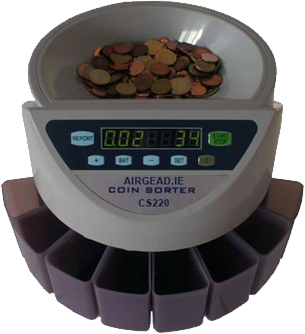 Our coin counters are extremely popular among businesses, charities and parishes who need a quick, efficient way to accurately count, sort and bag large amounts of loose change. We also stock note counters and money counting scales which take the hassle out of tilling up at the end of the day. Security is a vital part of the cash handling and management process. That’s why we have a large range of safes, in both standard and deposit style. Many of these safes are also fire resistant, so you can be sure your cash is protected from any threat. Our data safes are ideal if you require protection for electronic transaction records, computer media and digital equipment. With the problem of forged notes always present, a counterfeit detector is vital for your business. Our counterfeit note detectors are reliable and straightforward, and range from UV pens to magnetic ink sensors. We also stock a variety of other useful products for the shop, office or home business, including fireproof filing cabinets for that vital paperwork, cash drawers compatible with almost all cash registers, and paper folding machines that give a professional finish on even the highest volume of letters and written correspondence. Call us now on 1800 938 126 or email us at info@airgead.ie with any enquiries. Alternatively, browse through our site to find what you need. We offer a secure shopping experience and the fastest possible delivery times.